Small life update: Just in case you are not following me in instagram, you might have missed that we are having a pretty gigantic life change over here in the Christo family. Coco, who is 8 years old now just got a role of a lifetime and is going to be a lead role in a new Disney Channel Show. We have been secretly living in Vancouver, BC while she filmed the pilot the last few weeks and now get to be home for a few months before getting our bi-city groove on for a while as we flow back and forth between Vancouver and Seattle. Pretty nuts huh? Anyone with greater Vancouver area recommendations, please share them!!!! We now get to enjoy the rest of the Summer back in beautiful Seattle and I am really taking advantage and trying to get into my groove of getting back in the gym and eating healthfully. The good news is, the weather makes that much easier than normal to do. Plus our friend John dropped off a whole bunch of fresh salmon that he caught last week and we have been eating like kings. Thats how I knew I had to pull this recipe out for you! This is a vintage recipe from the blog, dating back to 2010! It had one really sad picture and pretty much no text, so I thought that it was the perfect opportunity to bring it out of the shadows and into the light! It is so tasty and great for summer, I knew it needed a major refresh and some new picture so that everyone could properly appreciate such a delicious dish! And please don’t forget the Asian Slaw that I serve it with, which is so incredibly good and the perfect side dish. 2 tablespoons toasted sesame seeds to garnish. 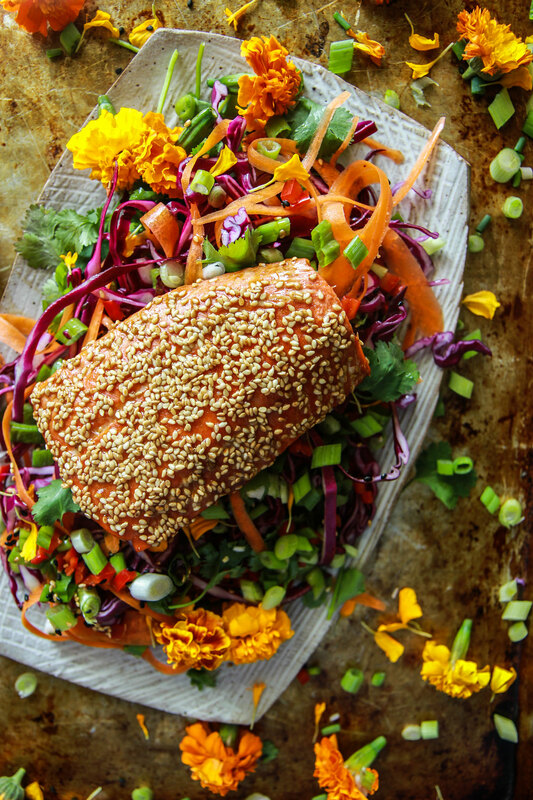 Place the salmon on a sheet pan lined with foil and coat each top with the glaze. 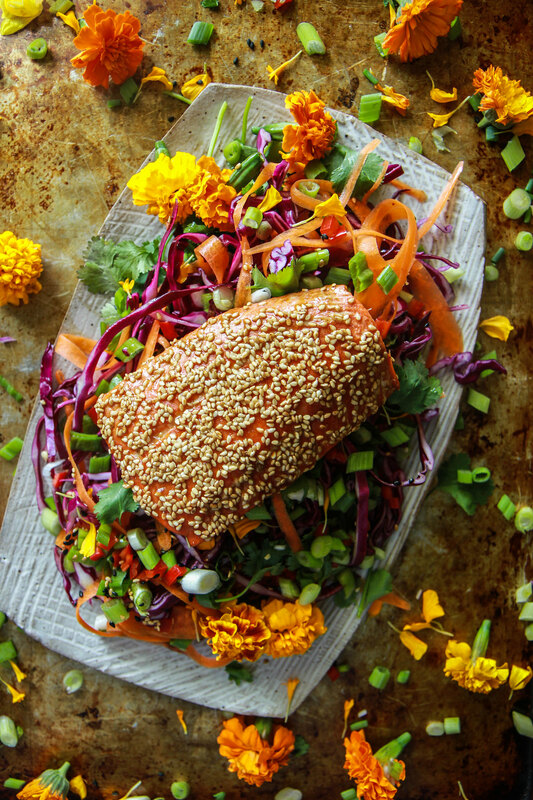 Liberally coat the top of the salmon with the toasted sesame seeds. Roast the fish in the oven at 400 degrees for 12-15 minutes, or until the fish is barely cooked through. 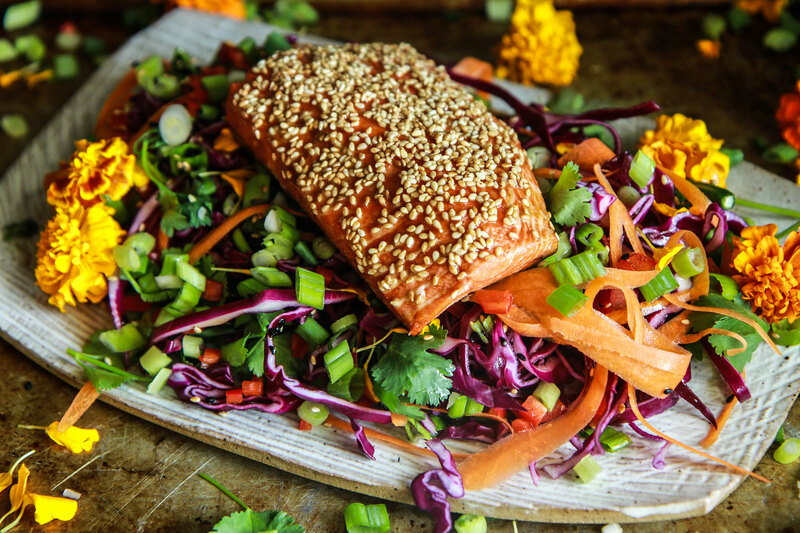 Serve hot on a bed of Asian Slaw. We will be making this! Always interested in easy ways to prepare good tasting, healthy fish dinners. Make the trip to Harrison Hot Springs Spa and Resort, an hour and a half east of Vancouver. Spend the night after soaking in the outdoor natural hot pools under the open sky and twinkly lit trees around the! Restaurants or room service afterward! Oh, wow! This dish is giving me major heart-eyes! Delicious and easy! We will definitely be making this again. Thank you! Awesome Samantha! I hope you like it!